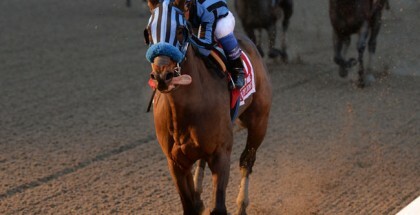 The Peter Pan Stakes is set to take place on Saturday May 11, 2013 at Belmont Park in Elmont, New York. The 59th running of the Peter Pan hosts eleven three-year-olds, a few which have their sights on the third jewel of the Triple Crown, The Belmont Stakes on June 8th. The winner of the 1 1/8 mile dirt race takes home a $200,000 purse. 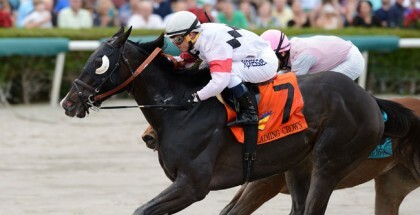 See 2013 Peter Pan Stakes odds and post positions below. Declan’s Warrior, with 4/1 odds, will break from post position #8. The Peter Pan Stakes will be Declan’s Warrior’s first attempt at racing farther than one mile. He is said to have a ton of energy and even looks good in the distance in recent workouts. Declan’s Warrior’s pedigree suggests he’ll tolerate the distance well. Incognito, with 5/1 odds, will break from post position #10 in the Peter Pan Stakes. He has placed first in his last two races. Incognito finishes strong and is expected to at least show in the 2013 Peter Pan Stakes. Saint Vegeur, with 6/1, odds has progressed rapidly since he started wearing blinkers. He has enough speed to maintain a mid-pack pace. Saint Vegeur has experience running with champions such as Orb and Itsmyluckyday. I also like Narvaez. The name “Narvaez” means dweller on a plain in the mountains. Narvaez will break from post position #6 with jockey John Velazquez aboard. Narvaez has 15-1 odds in the 2013 Peter Pan Stakes. The Peter Pan Stakes is run in honor of National Museum of Racing and Hall of Fame inductee, Peter Pan. 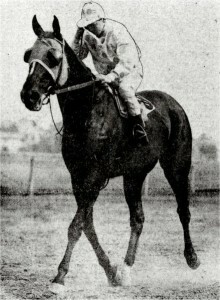 Peter Pan won the Belmont Stakes, The Brooklyn Derby, and the Brighton Handicap in 1907. Lady and The Track would like to wish all of the Peter Pan Stakes contenders the best of luck! Good Luck! Safe Run! The Peter Pan Stakes is the 9th race of the day with a 5:17 PM EDT post time. 9 Go Get The Basil 20/1 Ortiz Jr./Violette Jr.